request that talks be reopened with an improved pay offer. negotiate an improved pay offer for 2012.
at the BMA in 180 years. days of action are planned as the dispute continues. 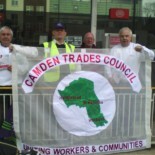 This entry was posted on July 24, 2012 by CAMDEN TRADES COUNCIL.